If anyone had told Mary Boelter Crafts-Homer (BS ’78) when her gelato shop failed after only four months that she would eventually create a company that would win an international caterer of the year award—though it would have sounded crazy—she would have believed them. Mary Crafts-Homer (right) ventured into business selling bread door-to-door, her boys in a wagon at her side. 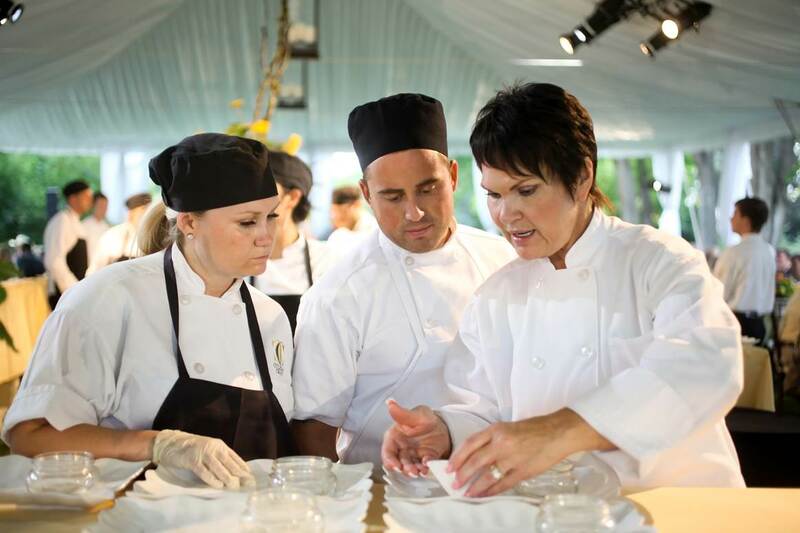 She’s now an award-winning caterer with clients that have included celebrities and royalty. Crafts-Homer graduated with a BYU degree in social work and had every intention of being a stay-at-home mom. She had not expected to become a businesswoman, and she certainly had not expected to provide for her family by cooking. “Food was just something people do for fun,” Crafts-Homer says. “But I couldn’t go back into social work and have an 8-to-5 job. . . . I wanted as much time with [my children] as possible.” The solution? She took tentative steps into entrepreneurship by selling her baked goods door-to-door, fresh bread under her arm and her little boys in a red wagon. She eventually launched the gelato company, which, despite its failure, became one of the most valuable things she ever did for her career. Thirty years later, Crafts-Homer is the prize-winning creator, CEO, and president of Culinary Crafts, the largest catering company in Utah and the only Utah company to win the Caterer of the Year Award from the International Caterers Association. Culinary Crafts has also been named Best of State Caterer 11 times in a row, and their clients have included U.S. presidents, British royalty, international figureheads, and such celebrities as Oprah Winfrey, Jay Leno, and Diane Keaton. And it’s still a family business. The kids who once slept on mattresses in the office after the workday are now company partners and directors. They have had myriad responsibilities within the business—from dishwasher to grill master to part-owner and director of operations. Crafts-Homer is as accomplished as the company she has nurtured through the years. Recognized as an excellent businesswoman and caterer, she speaks and presents on entrepreneurship nationwide, while still making time to volunteer for nonprofit organizations like United Way. “I want to give back to a community that helped and supported me,” she says. What’s next for Culinary Crafts? A 19,000-square-foot corporate office, a new television series, a cookbook, a food truck, and a culinary learning series featuring local Utah artisans. But she says that’s not all. “I’m going to start doing gelato again,” says Crafts-Homer. Heat olive oil in sauté pan. Sweat onions in olive oil for two to three minutes. Add garlic, red pepper flakes, thyme, and basil to pan. Deglaze pan with a splash of water, then add tomatoes. Reduce mixture for 20 to 30 minutes, then remove from heat. Puree in food processor or blender, or use an immersion blender. Add cream. Reheat if necessary, but do not boil. 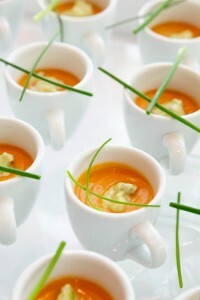 Can be garnished with avocado cream (avocado mixed with sour cream) and chives.